The Predators now have three of their top four defencemen (Ellis, P.K. Subban and Mattias Ekholm) signed through the 2021-22 season and Roman Josi signed through 2019-20. "Ryan is a huge part of our team on and off the ice and we are happy to have his leadership remain in our locker room for the foreseeable future," Predators general manager David Poile said Tuesday in a statement. "We have talked about wanting to keep the core of our team together, and this is another opportunity to help us do so while continuing to compete for a Stanley Cup. Ryan is entering his prime and is one of the reasons why we feel this team has a chance to win every time we step on the ice." 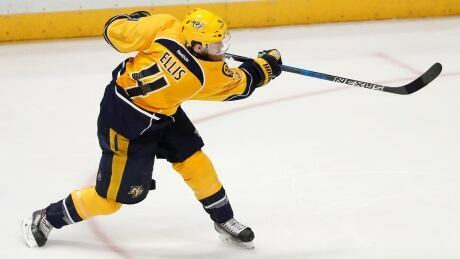 Ellis scored nine goals and set career highs in assists (23) and plus-minus rating (plus-26) in 2017-18 despite playing in only 44 games due to his recovery from off-season knee surgery. He didn't make his season debut until Jan. 2. He has 22 playoff assists to rank second in Predators history. His 27 career playoff points rank third on the franchise's all-time list.